Debunking Christianity: An Awkward Proposition: Can Atheists Learn Something From Evangelicals? No matter how rancid a person is, it is unlikely that they are 100% wrong about everything, and it is worth noting the things he does get right. And as it happens, evangelical Christians, hate us as they may, are right about one thing-and it doesn't matter that they have reached that conclusion through flawed epistemology. That cannot be taken to mean the conclusion itself is wrong; as the saying goes, even a broken clock is right twice a day. And evangelicals know one thing better than essentially everyone else in the US. Of course, I am talking about Islam. Jody Baumgartner, Peter Francia and Jonathan Morris, from East Carolina University, go on to point out that Evangelical Christians are more likely to back an aggressive foreign policy in the Middle East, and to have negative views of Islam, as noted in their article in Political Research Quarterly. It doesn't matter that this groups motives for backing aggressive policies concerning the Middle East is likely their messianic delusions. Islam today is different than other religions, and if evangelicals understand this point better than anyone else, even though thanks to IS atrocities, the rest of the society seems to be catching up. It may surprise you to learn that even after 9/11, few Americans thought Muslims were encouraging violence as part of their religious doctrine. A poll question asked by the Pew Research Center asked "Which statement is closer to your views, even if neither is exactly right? The Islamic religion is more likely to encourage violence among its believers, or The Islamic religion does not encourage violence more than others. Of those responding in March of 2002, only 25 percent of Americans thought Islam incited its members to violence. Half thought Islam does not encourage such violence among its adherents, with the remainder being unsure. That seems to have changed, in the wake of high profile beheadings in Iraq, Syria and other cases where such events are videotaped and displayed in the media. 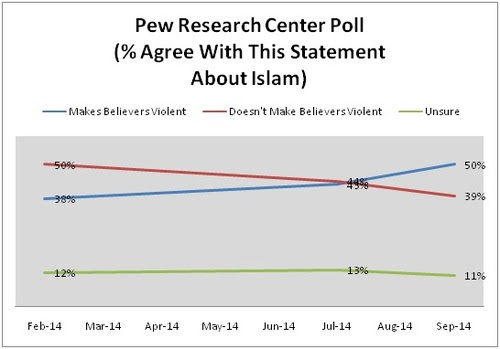 Such numbers of Americans associating Islam with violence rose during the Iraq War. Those who feel Muslims are incited to violence by their religion fell after the Iraq withdrawal to only 38 percent in February of 2014. But now, in September of 2014, that numbers has grown to 50 percent, mostly likely associated with the violent beheadings conducted by ISIS fighters, and captured on videotape. Mind you, this was before the recent attacks in Quebec, the Canadian parliament, and Queens. So yes, the truth is finally coming out. And if evangelicals led the public on the subject I see no reason to deny them credit for being right, for a change.